A biostable, semi-synthetic cutting fluid designed for use in applications where extra lubricity and extreme pressure properties are required, such as: Sawing of aluminium and aerospace alloys. Broaching. Screw cutting of alloy steels. Deep hole boring. Spray applied gun drilling Forming. When mixed with water Supercut 1000 forms a stable milky emulsion which can be used in most conventional machining operations. Unison Edgeplus is a cost effective product that exhibits excellent corrosion protection and exceptional service life for a conventional fluid of this type. SUPERCUT 3000 is a micro-emulsion metalworking fluid that is readily miscible with most mains water producing a transparent blue emulsion that is suited to a wide variety of applications. 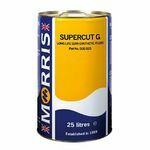 Supercut 4000 is a micro-emulsion metalworking fluid is readily miscible with most mains water to produce a translucent green emulsion that is suited to a wide variety of applications. Supercut 4000 has excellent lubricity, is low foaming, offers excellent workpiece visibility, excellent resistance to bacterial degradation and extended sump life. A long life, semi-synthetic, micro-emulsion cutting fluid incorporating the latest performance additives. It has high oil content and high lubricity, which coupled with chlorine free extreme pressure additives, ensures excellent machine performance. The translucent emulsion gives good workpiece visibilty. An excellent coolant for workshop rationalisation. Supercut 8000 yields multi-metal compatibility, high tolerance to tramp oil and excellent surface finishes on many different alloys. The product has been specifically developed for use witnthe more difficult to machine alloys, whilst carefully selected corrosion inhibitor systems ensure stain free performance3 on steels, brasses and aerospace aluminium alloys.